Michael Roy attended Arizona State University, obtaining a Bachelor of Arts degree in Political Science in 2010 with a minor in philosophy. He holds certificates in ethics and international studies. Mr. Roy received his Juris Doctor from James E. Rodgers College of Law at the University of Arizona in 2013. Michael Roy was admitted to the State Bar of California in 2014. Mr. Roy joined the San Francisco office of Dietz, Gilmor & Chazen in 2017 as an associate attorney, representing insurance carriers, self-insured employers, and public entities in all aspects of workers’ compensation. 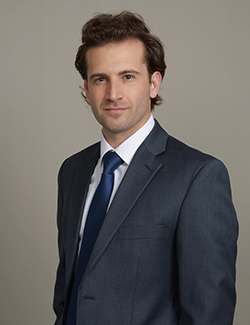 Michael Roy’s experience in workers’ compensation defense includes working as a law clerk, a hearing representative, and as an attorney at a firm in Los Angeles. An avid golfer, Michael often spends his leisure time on a golf course or cheering on his favorite football team, the Sun Devils.